The U.S. Commission on Civil Rights published a report Thursday titled Public Education Funding Equity: In an Era of Increasing Concentration of Poverty and Resegregation, which confirms what educators have known for a long time now -- that educational resources and outcomes have a lot to do with a child's particular neighborhood. Residential segregation causes a disparity in educational opportunity because it creates higher-income communities, with predominantly white school districts that have more local tax revenue for their schools, compared to fewer dollars and resources for school districts in low-income, minority neighborhoods. The Chair of the U.S. Commission of Civil Rights, Catherine Lhamon said, “low-income students and students of color are often relegated to low-quality school facilities that lack equitable access to teachers, instructional materials, technology and technology support, critical facilities, and physical maintenance,” in the Letter of Transmittal of the briefing report. The inequitable spending results in achievement gaps among predominantly Black and Latino students. A study in “The Nation’s Report Card: Trends in Academic Progress” (2012) found that in 2012, students who did not participate in the National School Lunch Program scored an average of 37 points higher on the NAEP reading test than students receiving free lunch, and an average of 24 points higher than students receiving reduced-price lunch. Schools with a majority of Black and Latino high school students have less access to high-rigor courses than predominantly white schools. For instance, the authors said, 33 percent of high schools with high black and Latino enrollment offer calculus, compared with 56 percent of high schools with low black and Latino student populations. Nationwide, 48 percent of schools offer the rigorous math course. There is also a lack of courses in STEM (Science, Technology, Engineering and Math) as well as Advancement Placement (AP) courses. This is a major factor in why Blacks and Hispanics are still heavily underrepresented in the STEM workforce relative to their shares in the U.S. workforce as a whole, according to Pew Research. When exploring the disparities in teacher salaries, the USCCR briefing report finds that the highest teacher salaries are reported in wealthy, suburban districts which serve predominantly white students. Districts that serve the highest proportion of low-income students and students of color are populated by about twice as many teachers lacking credentials and experience. 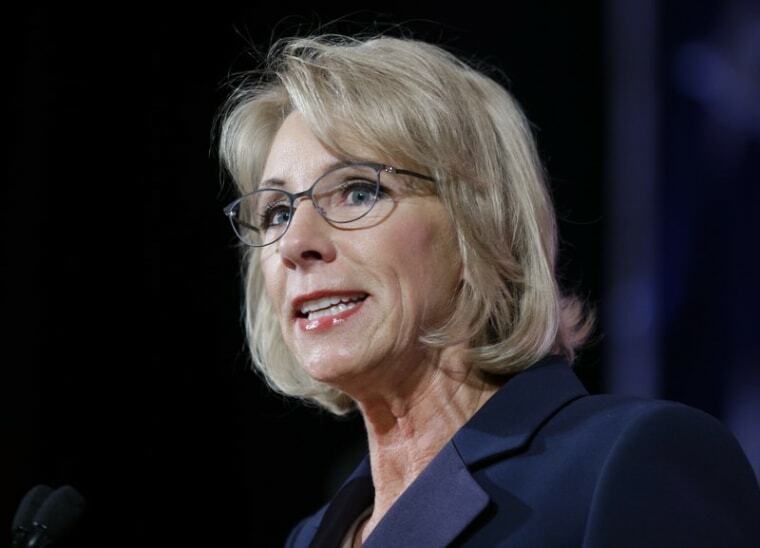 Education Department spokeswoman Liz Hill said the commission’s findings underscore the need for reform through the promotion of charter schools, voucher programs and other forms of school choice. These are key goals for the Trump administration and Education Secretary Betsy DeVos. But the answer, say the authors of the report as well as many education experts, is to try to level the playing field when it comes to public school funding, so that the amount of local tax dollars does not dictate the quality of the school district. “Money matters. If you don’t have it, you cannot spend it,” said Bruce Baker, a professor of education at Rutgers University. Baker said that states should do a better job in raising education funding and in equalizing spending among school districts. He also called for a greater federal role in making sure that less affluent states that need additional education funding get it. But Eric Hanushek, a fellow at the Hoover Institution of Stanford University, disagrees. “Money is not the secret recipe,” Hanushek said. “How much is spent on schools is not as important as how the money is spent.” For instance, he said, simply increasing the salaries of all teachers in a high-need school district won’t have as much of an impact as identifying high-performing teachers and increasing their salaries.